CAITLYN O’DONNELL - TRA-BROCKTON YPP SUCCESS STORY | Training Resources of America, Inc. The mother of a 2 year-old son, Caitlyn O’Donnell started the Young Parents Program in January 2013. Throughout her enrollment, Caitlyn worked diligently on improving her reading, writing, and math skills. In addition, Caitlyn was present during Harbor One, H&R Block, and HIV/AIDS Prevention presentations. Caitlyn also accompanied Team TRA in the walk for Old Colony Hospice, participated in a field trip to the DeCordova Art and Sculpture Museum, and took a workshop on job interviewing skills. In June 2013, Caitlyn was finally ready to take her GED test. Due to Caitlyn’s efforts throughout her enrollment, she was able to pass all subjects; thus, earning herself a GED. 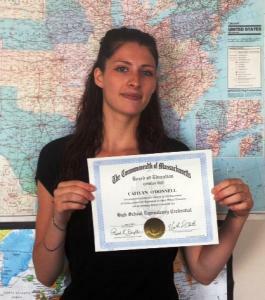 Since completing the program, Caitlyn has enrolled in Lincoln Technical Institute in Brockton, MA. She is now pursuing her goal of becoming a dental assistant.